Light and silky with just a hint of sparkle, this perfumed body powder leaves your skin smooth, comfortable, pampered and lightly scented with Beautiful. The fragrance of a thousand flowers, Beautiful is a rich blend of rose, tuberose, lily and orange flower, with a touch of citrus to brighten and wood to warm. How to use: To create a richer, longer-lasting scent, layer with other products in the Beautiful line. Use the puff to apply all over your skin. 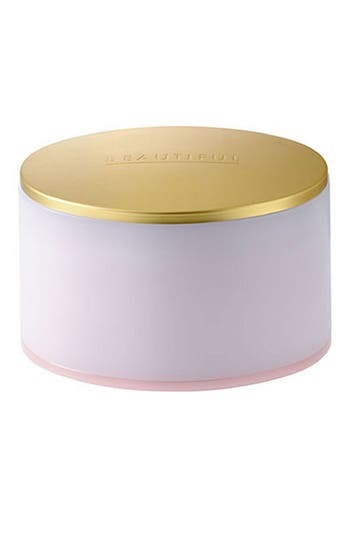 Style Name: Estee Lauder Beautiful Perfumed Body Powder With Puff. Style Number: 15146U. Available in stores. What it is: A soothing cream. Who it's for: Anyone with dry or sensitive skin types. 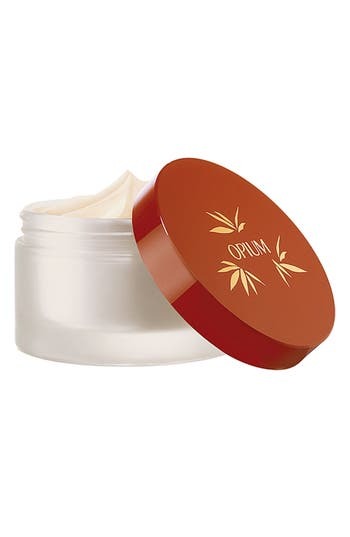 What it does: This cream disappears right into your skin, leaving it softer and more supple. It features the same fresh, clean scent as the fragrance of the same name, inspired by the mountains and fjords of Norway. Style Name: Laila Hand & Body Cream (Nordstrom Exclusive). Style Number: 61856. Available in stores. Drench yourself in a blanket of soft, luxurious cashmere with Cashmere Mist Body Creme by Donna Karan. The indulgent formula nourishes your body while leaving it velvety soft and improving the texture of dry, flaky skin. Notes: bergamot, jasmine, lily of the valley, suede, cashmere accord, sandalwood, amber, musk, vanilla. Style Name: Donna Karan 'Cashmere Mist' Body Creme. Style Number: 11314U. Available in stores. Wrap your skin in the soft, luxurious scent of cashmere with a dual-purpose formula that both cleanses and moisturizes. The Body Cleansing Lotion by Donna Karan also works to condition your skin while rinsing off easily and removing impurities without stripping your skin and covering you in the beloved scent of Cashmere Mist. Notes: bergamot, jasmine, lily of the valley, suede, cashmere accord, sandalwood, amber, musk, vanilla. Style Name: Donna Karan 'Cashmere Mist' Body Cleansing Lotion. Style Number: 11315U. Available in stores. What it is: A lightweight lotion that softly scents your skin. What it does: This velvety-smooth formula covers you in notes of rose, muguet, lilac and sparkling apricot blossom- 6.7 oz. 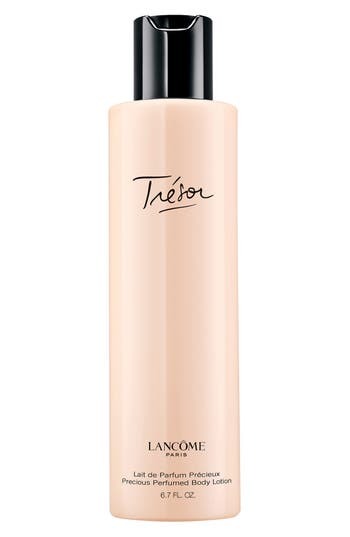 Style Name: Lancome Tresor Body Lotion. Style Number: 14381U. Available in stores. Happy Body Cream is a smooth-as-silk formula that hydrates skin, leaving it lightly scented with the fresh, vibrant notes of Clinique Happy, with its hint of citrus, a wealth of flowers and mix of emotion. Wear it and be happy all over. How to use: Apply to skin. For a longer lasting scent, mix with other Happy products- 6.7 oz- Allergy tested. 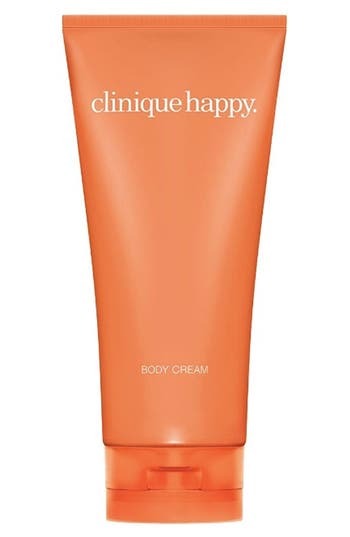 Style Name: Clinique 'Happy' Body Cream. Style Number: 14562U. Available in stores. Elegance, sensuality, subtlety, feminine influence. Inspired by an Oriental love story, Shalimar is the dazzling essence of a woman who is forever desired. With its bath and body line, Shalimar celebrates feminine beauty by offering sensual and refined rituals for the senses. Experience a sensuous body cream, enriched with orchid extracts and active ingredients to moisturize and smooth skin, leaving it nourished, satiny and delicately perfumed. 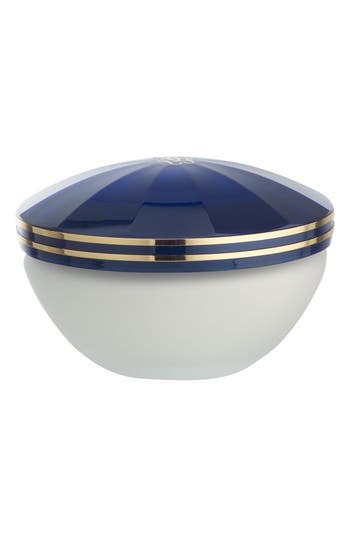 Style Name: Guerlain 'shalimar' Body Creme. Style Number: 633519. Available in stores. What it is: A luxurious, silky loose powder. What it does: It's perfect after the bath or shower to delicately scent skin with the radiant, sensual fragrance of Tresor. How to use: Dust over the entire body to absorb moisture for cooling comfort and skin that feels velvety-soft all day. It includes its own companion puff. 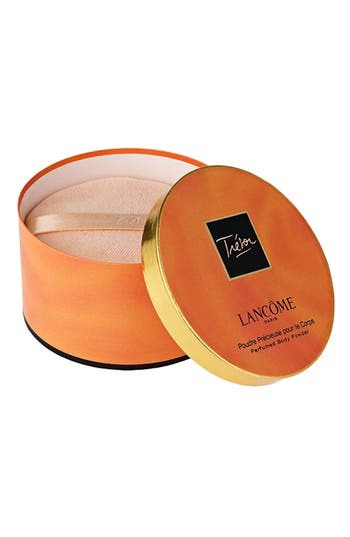 Style Name: Lancome Tresor Perfumed Body Powder. Style Number: 12408U. Available in stores. Ultra-rich whipped souffle creme scented with a blend of the finest extracts. Use day or night for luxurious moisture protection without being heavy or greasy. Creme Brulee fragrance is a deep rich caramel with nuances of sugar, vanilla and musk. Style Name: Laura Mercier 'Creme Brulee' Souffle Body Creme. Style Number: 12897U. Available in stores. Embrace the floral and musky base of Eclat d'Arpege. A sophisticated, feminine and modern classic fragrance by Lanvin. Notes: lemon leaves, lilac, osmanthus, peach blossom, peony, wisteria, tea, cedarwood, amber, musks. 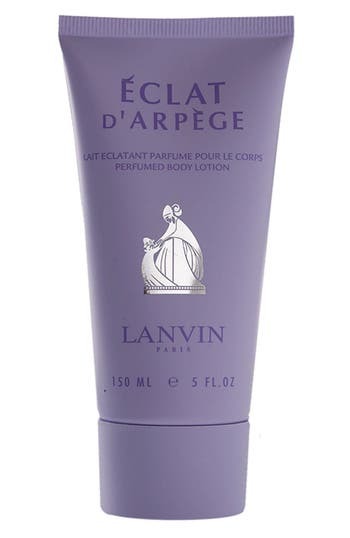 Style Name: Lanvin Arpege 'eclat D'Arpege' Body Lotion. Style Number: 53182. Available in stores. The YSL Paris Bath & Body Range is inspired by the rose. Sensuous products provide the velvety touch of a rose petal and enhance the skin's natural sparkle. 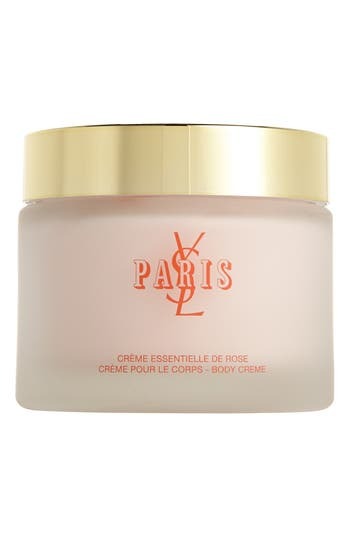 The Body Creme has a velvety texture, leaving the skin soft and delicately scented with notes of YSL Paris. Style Name: Yves Saint Laurent Paris Body Creme. Style Number: 255931. Available in stores. This delicately scented lotion becomes a caring gesture for the whole body, leaving the skin soft, supple, comfortable and hydrated. For Her Body Lotion nourishes the skin with vitamin E, helps skin regain its smoothness and preserves its natural beauty. Notes: orange blossom, osmanthus, rose, solar musk, peach, amber, soft musk, vanilla, vetiver, musk. Style Name: Narciso Rodriguez For Her Body Lotion. Style Number: 148766. Available in stores. What it is: A lightweight body moisturizer lightly scented with the brand's best-selling Beach fragrance. Why it's different: It's formulated with a soothing and hydrating blend of aloe vera, olive, jojoba and sunflower oils plus green tea and vitamin E for antioxidant protection. It helps reduce peeling and helps prolong the life of your tan. This moisturizer is scented with a lightly intoxicating blend of sand jasmine, sea spray and mandarin. How to use: Apply to clean skin. Massage a liberal amount onto dry areas. Do not use on your face. 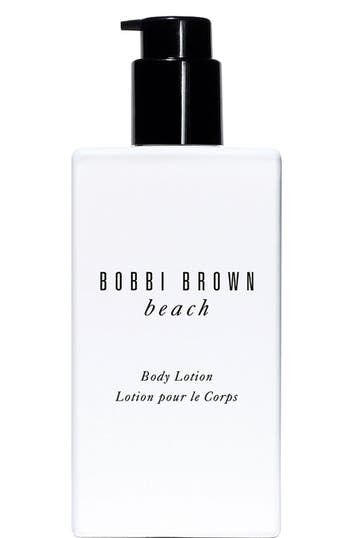 Style Name: Bobbi Brown Beach Body Lotion. Style Number: 156658. Available in stores. Shalimar is a fragrance to excite and express desire. She who dares to wear it is asserting her femininity and ultra sensuality. Hers is carnal seduction at the frontier of the forbidden. Shalimar gives her the freedom to express her feelings and desires, relating to her perfume with the utmost in passion. Wearing Shalimar means surrendering control to the senses. Notes: bergamot, lemon, jasmine, rose, May rose, iris, incense, opopanax, tonka bean, vanilla. 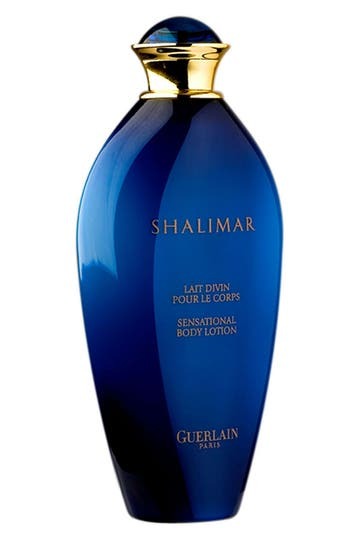 Style Name: Guerlain 'shalimar' Body Lotion. Style Number: 217698. Available in stores. Full-bodied and opulent, Bomblicious is a floral explosion, a profusion of flowers that has the power to make everything seem more positive. Bomblicious Body Lotion leaves skin luxuriously smooth and scented. Notes: bergamot, tea, freesia, jasmine, orange blossom, orchid, rose, patchouli. 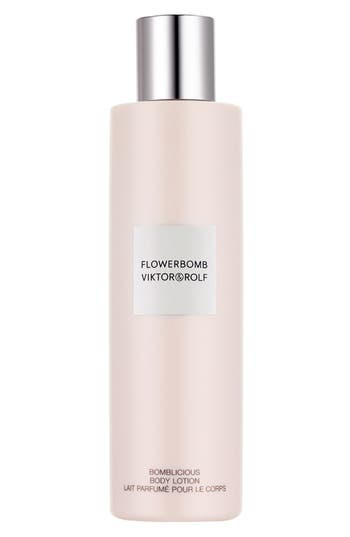 Style Name: Viktor & rolf 'Flowerbomb' Bomblicious Body Lotion. Style Number: 36661. Available in stores. This is a medley of crisp citrus and green notes artfully paired with exotic spice and natural wood essences. Top notes of vibrant Italian bergamot, sweet verbena and fresh vetiver are enhanced by the subtle sweetness of rosewood, warm sandalwood and aromatic cardamom. Style Name: Antica Farmacista 'santorini' Body Moisturizer. Style Number: 250945. Available in stores. What it is: Bomblicious Body Creme is an explosive hydrating treatment to support the power of the fragrance. Fragrance story: Full-bodied and opulent, Bomblicious is a floral explosion, a profusion of flowers that has the power to make everything seem more positive. Notes: bergamot, tea, freesia, jasmine, orange blossom, orchid, rose, patchouli. 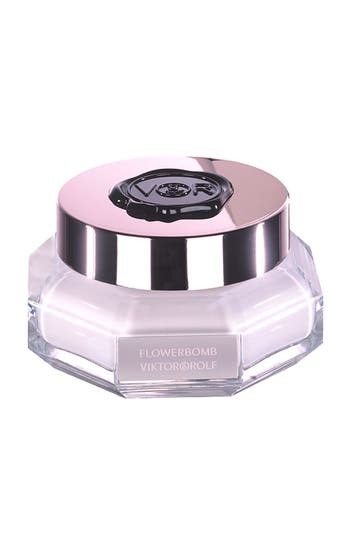 Style Name: Viktor & rolf Flowerbomb Bomblicious Body Creme. Style Number: 61600. Available in stores. Delicately scented with a crisp, fresh and clean scent, pure grace body lotion by philosophy leaves you feeling infinitely clean and refreshed. It hydrates your skin, leaving it with silky soft, super smooth feel while shea butter and natural oils help replenish and maintain your natural moisture barrier to keep it hydrated. How to use: Apply a generous amount to skin with fingertips, massaging in gently with a soothing, circular motion. 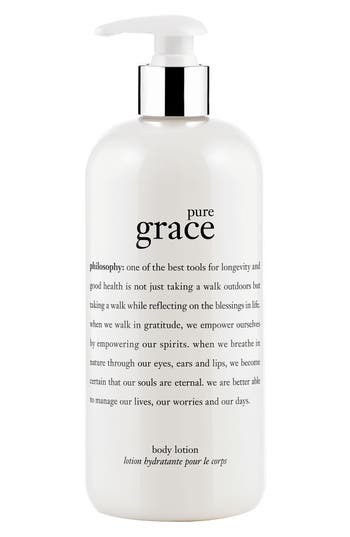 Style Name: Philosophy 'Pure Grace' Perfumed Body Lotion. Style Number: 113656. Available in stores. The scent of clementine leaves in the morning dew sparkles above a heart of orange blossom and water lily, transporting the wearer to a garden oasis. Orange Blossom Body Lotion keeps skin silky smooth and is a deliciously fragrant way to feel pampered every day. 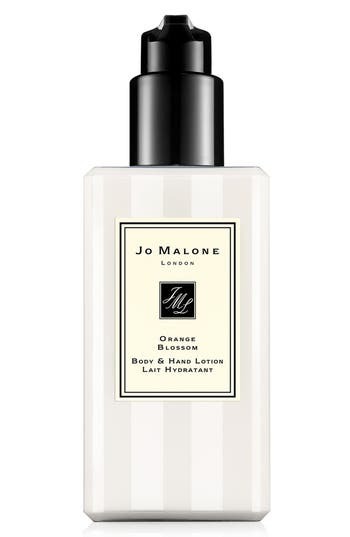 Style Name: Jo Malone London Orange Blossom Body Lotion. Style Number: 247793. Available in stores. The scent of clementine leaves in the morning dew sparkles above a heart of orange blossom and water lily, transporting the wearer to a garden oasis. Orange Blossom Body Creme, an exquisite combination of texture and scent, is the utmost indulgence. It keeps skin soft and pampered every day. 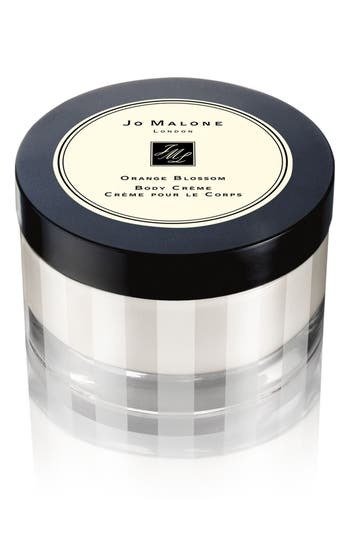 Style Name: Jo Malone London Orange Blossom Body Creme. Style Number: 247820. Available in stores. What it is: An exquisite combination of texture and scent, this creme is the utmost indulgence, keeping skin soft and pampered every day. Fragrance story: A youthful and fruity fragrance, Nectarine Blossom & Honey is inspired by the delicious scent of just-ripening nectarines and a taste of refreshing peach sorbet. Mouthwatering nectarine and peach with hints of plum, blackcurrant and vetiver are combined with the sweet warmth of acacia honey in this truly seductive combination. 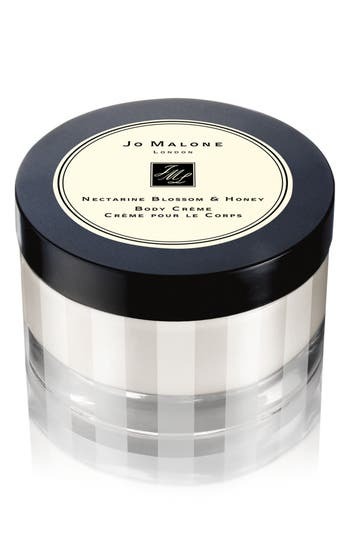 Style Name: Jo Malone London Nectarine Blossom & Honey Body Creme. Style Number: 247814. Available in stores. Inspired by a mixture of Donatella Versace's favorite floral fragrances, Bright Crystal is a fresh, sensual blend of refreshing chilled yuzu and pomegranate mingled with soothing blossoms of peony, magnolia, and lotus flower, warmed with musk and amber. Notes: iced accord, yuzu, pomegranate, peony, magnolia, lotus flower, acajou, vegetal amber, musk. Style: Sheer. Sensual. Luminous. 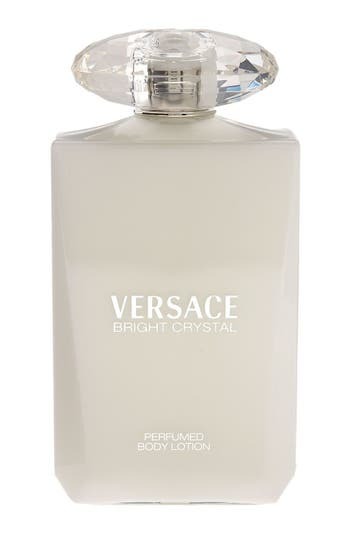 Style Name: Versace 'Bright Crystal' Body Lotion. Style Number: 125490. Available in stores. A luxurious body emulsion that glides on like satin to smooth and silken skin, leaving the body scented with Tom Ford Black Orchid. Notes: bergamot, citrus accord, mandarin, gardenia, jasmine, ylang-ylang, lotus, orchid spicy floral accord, orchid, patchouli, sandalwood, incense, vanilla. 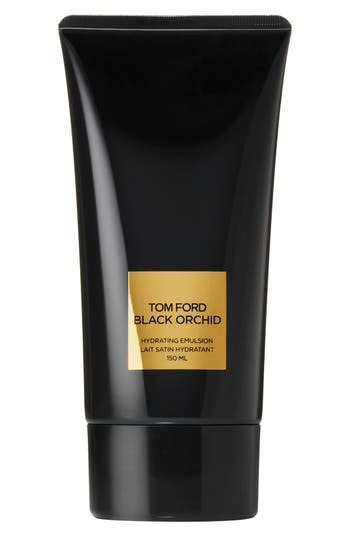 Style Name: Tom Ford 'Black Orchid' Hydrating Emulsion. Style Number: 187504. Available in stores. The Opium Bath and Body range is filled with sensual and refined rituals. The products are enriched with Asian ingredients for intimate perfumed moments filled with pleasure. On application, the luxurious Rich Body Creme melts into the skin and leaves it feeling supple, hydrated and lightly scented with the sensual aura of Opium. Style Name: Yves Saint Laurent Opium Body Creme. Style Number: 255942. Available in stores. A shimmering, sheer, instantly moisturizing fluid with the skin-protective essence of jasmine flower extract along with J'adore's other luxurious fruity floral essences. Absorbs instantly. Protects and smoothes for hours. Elegant white and gold bottle. 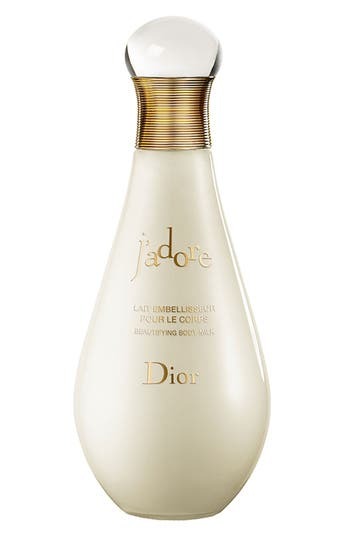 Style Name: Dior 'J'Adore' Beautifying Body Milk. Style Number: 247478. Available in stores. An absolutely gorgeous rendition of a classic orange blossom scent. This bright fragrance begins with captivating citrus notes of mandarin and Sicilian lemon which blend beautifully with floral notes of orange blossom and white floral notes of jasmine and lily of the valley. This floral scent is beautifully balanced and exhilarating. 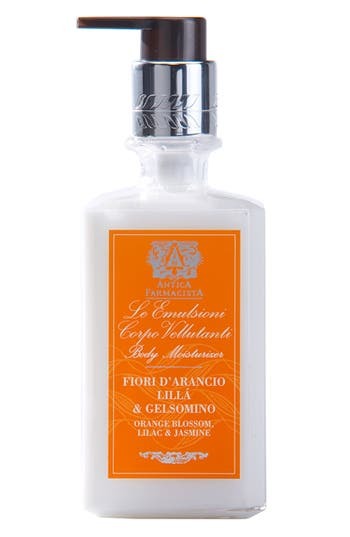 Style Name: Antica Farmacista 'Orange Blossom, Lilac & Jasmine' Body Moisturizer. Style Number: 250948. Available in stores. Satisfy your skin's heavenly yearnings with the ultimate glamorous indulgence with Angel by Mugler Perfuming Body Cream. Its rich and creamy texture wraps your skin in a celestial robe of softness while the intense facets of Angel bring pleasure to all your senses. Voluptuously and deliciously scented, the body cream smoothes and nourishes the skin. Contained in a shimmering silver and glass jar, enhanced by a shooting star rim, the heavenly cream envelops the skin with the Intense Diffusion System (IDS technology).Notes: bergamot, mandarin, helional, hedione, dewberry, honey, berries, patchouli, sandalwood, coumarin, vanilla, caramel, chocolate. 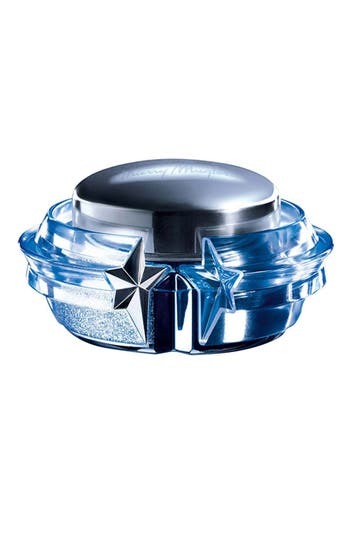 Style Name: Angel By Mugler Perfuming Body Cream. Style Number: 243061. Available in stores. A luxuriously silky lotion that melts into the skin with its heavenly touch, leaving behind the delicious facets of Angel. This moisturizing and softening body lotion envelops the skin with luscious and airy notes of Angel thanks to its Intense Diffusion System (IDS technology). The iconic star-shaped packaging also features a better dispensing system with an innovative 'twist-up' cap. Notes: bergamot, mandarin, helional, hedione, dewberry, honey, berries, patchouli, sandalwood, coumarin, vanilla, caramel, chocolate. 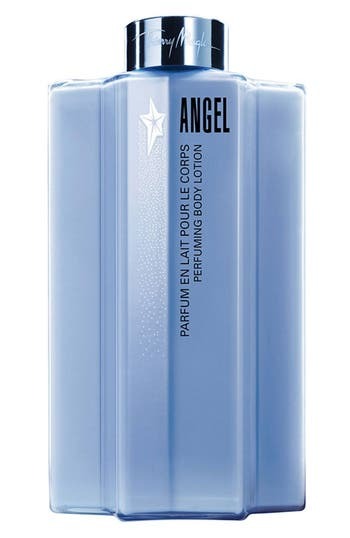 Style Name: Angel By Mugler Perfuming Body Lotion. Style Number: 243060. Available in stores. Soften and pamper your delicate hands with the sensual touch of an Angel. Like a pair of silky Angel gloves, the luxurious hand cream melts into the skin, creating a lasting layer of heavenly luxury with the Intense Diffusion System (IDS technology). Give your hands an endless feeling of lasting comfort and softness. This velvet cream leaves a scented, non-greasy protective layer on your skin. Notes: bergamot, mandarin, helional, hedione, dewberry, honey, berries, patchouli, sandalwood, coumarin, vanilla, caramel, chocolate. 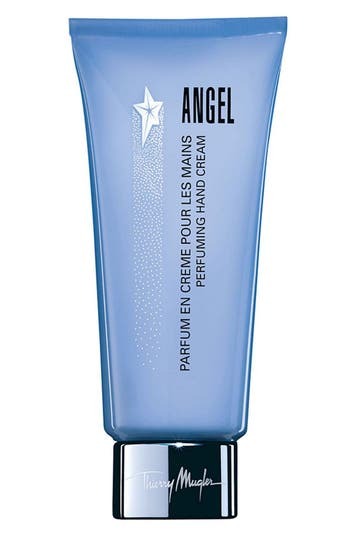 Style Name: Angel By Mugler Perfuming Hand Cream. Style Number: 243063. Available in stores. Inspired by the unique spirit and style of truly exceptional champagne, this fragrance is vibrant, fresh and ravishing. Sparkly top notes of satsuma citrus balance beautifully with subtle floral notes of muguet. Sensuous apricot, nectarine and passion fruit complement the sweetness of sugared black currant. Mellow accents of sweet vanilla ground this incredibly fresh, effervescent scent. 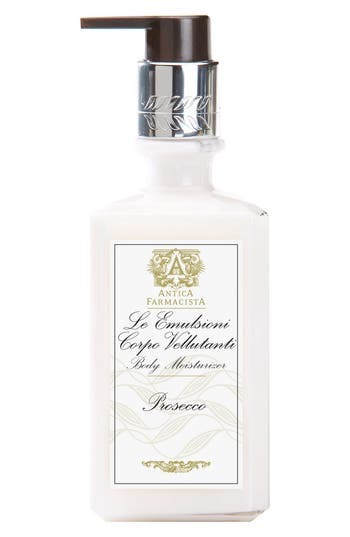 Style Name: Antica Farmacista 'Prosecco' Body Moisturizer. Style Number: 279265. Available in stores.